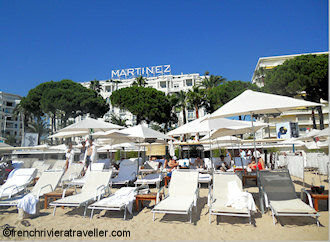 The best thing about beaches in Cannes is that they are all sandy! What a pleasure. Unlike the galets on Nice beaches, you don't need special equipment like rubber shoes and padded towels to be comfortable. The fine sand is replenished at the beginning of each summer season and kept scrupulously clean throughout the year. As Cannes is at the foot of a wide bay, the drop-off is shallow and the waters are usually calm. The downside of Cannes beaches is that the prime beach locations along La Croisette have been commandeered by the fancy hotels lining the boulevard and you have to pay to use them. For a lounge chair and parasol for the day, prices start at €25 in high season. But there are some very nice public beaches in Cannes as well. The public beach west of the Majestic Hotel, Macé, has a free portion and a municipal portion where you can rent chairs and umbrellas at a reduced price. Further west, past the private beaches on the blvd Jean Hibert, is a long stretch of public beach, Plage du Midi. Walk east and you come to the free portion of Bijou Plage, which is a non-smoking beach, and Zamenhoff, another managed municipal beach. And even further east is the long stretch of public beach on blvd Gazagnaire. More. 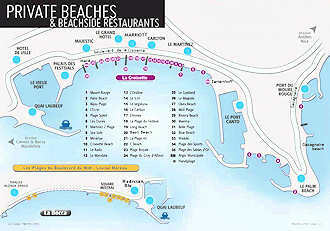 See more about Cannes beaches, including complete descriptions of all public and private beaches. For more alternatives, don't hesitate to hop a boat and head out to the Iles Lerins. The two offshore islands of Ile St-Honorat and Ile Ste-Marguerite have rocky but free coastlines.